The two-year long wait for Telangana State - State Eligibility Test (TS SET) notification finally released by Osmania University with the OU announcing that the TS SET exam would be conducted on June 5, 6, 8. Submission of applications is online and will begin from March 27. Last date for online submission without late fee is April 26. The SET is held for eligibility for assistant professor and lecturer posts in universities and private degree colleges. This is the first SET since the formation of new State of Telangana. 2. Commencement of Submission of Online Applications: March 27, 2019. Telangana State Eligibility Test, TS SET Results 2019 have been declared. Candidates who had appeared for the examination can now check their result on the official website, telanganaset.org. Steps and a direct link to check TS SET 2019 Results have been given below. Candidates are advised to keep their admit cards handy.Osmania University is expected to release the Telangana State Eligibility Test or TS SET Results 2019. The Results would be declared by the university on the official website of telanganaset.org. Steps to check the results along with the direct link to the website are provided below. As per the reports, TS SET Results 2019 would be released at 4 pm today at the Telangana State Council of Higher Education Office. Osmania University, Hyderabad had conducted the TSSET 2019 on July 5, 6, 8 on behalf of the Telangana State Council of Higher Education Office. As many as 50,000 candidates have reportedly appeare for the examination which was conducted for 29 subjects. The steps to check the results are provided below. Step 1: Candidates need to visit the official website to check the TS SET Results 2019. Step 3: Click on the download link for TS SET 2019 Results 2019. Step 4: A new window would pop. Enter registration details. Step 5: The results would be displayed on your screen. The registration fee is Rs 1200 for general category, for BC category it is Rs 1000 and Rs 700 for SC/ST/PWD category. Candidates can download TS SET hall tickets from July 25. The university has decided to take biometric details of the candidates who appear for the examination. This apart, the Aadhaar number has been made mandatory for applying for the examination. Candidates appearing for the examination will be given carbon copy of the OMR sheet and after releasing final TS TET results, OMR sheets of candidates will be placed on the website. The examination will be conducted in seven regional centres - Adilabad, Hyderabad, Karimnagar, Mahabubnagar, Nalgonda, Nizamabad and Warangal. The accreditation for university to conduct the SET concluded in 2015. After the State formation, the university got authorisation from the government to conduct the test, but there were delays in getting accreditation from the University Grants Commission (UGC). Recently, the UGC committee visited the university for inspection and based on the recommendations of the accreditation committee, accorded permission to conduct SET once in a year during the next three-year period in 29 subjects. It is hereby informed that the office of The Telangana State State Eligibility Test(TS-SET) has modified the criteria for the declaration of TS SET 2017 result as per the UGC Lr.No.F.4-2/92 (NET) Dt: 05.05.2017. For the further details visit: http://www.telanganaset.org/. Note: Revised procedure & criteria for declaration of TS - SET 2017 Results as per UGC Guidelines. policy of the Government of India. It may be noted that the above qualifying criteria is final and binding." 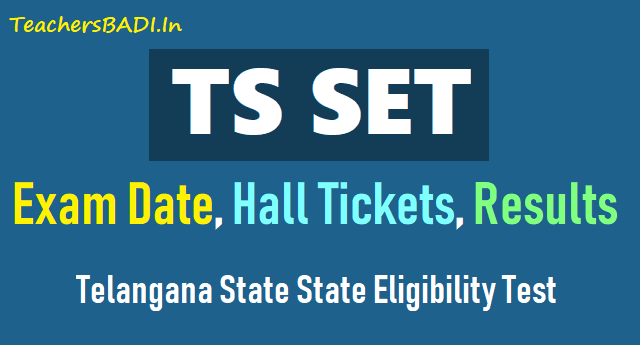 Web Note: TS.SET-2019 Hall tickets will be released in July first week. Revised procedure & criteria for declaration of TS - SET 2019 Results as per UGC Guidelines. NOTE-TS.SET-2019 - In view of the Kerala High Court Judgement,the procedure and criteria for declaration of SET results will be informed as and when information received from UGC-NET Bureau, Member Secretary , TS.SET-2019. Date of Examination of TS SET is 5, 6 and 8-07-2019.